While Capt. 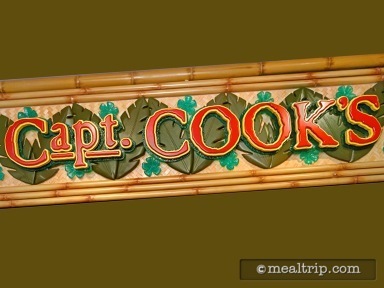 Cook’s does offer indoor and outdoor seating, the location still feels a bit small for a resort that’s so large. It is located on the ground floor of the main Polynesian lobby building and has both interior and exterior entrances. The breakfast menu consists mostly of the standard hot items (egg and bacon platter, breakfast burrito, Mickey waffles, etc.) and cold breakfast items (pastries, bagel, muffins, etc.) that you will find at most counter service breakfast locations. There is one fairly significant breakfast item on the menu item here though... and that’s the famed "Tonga Toast" that’s similar to the entree of the same name that you will find at the Kona Cafe. The location is said to be open from 12:00am until 11:59pm each day, but those hours may be reduced seasonally.